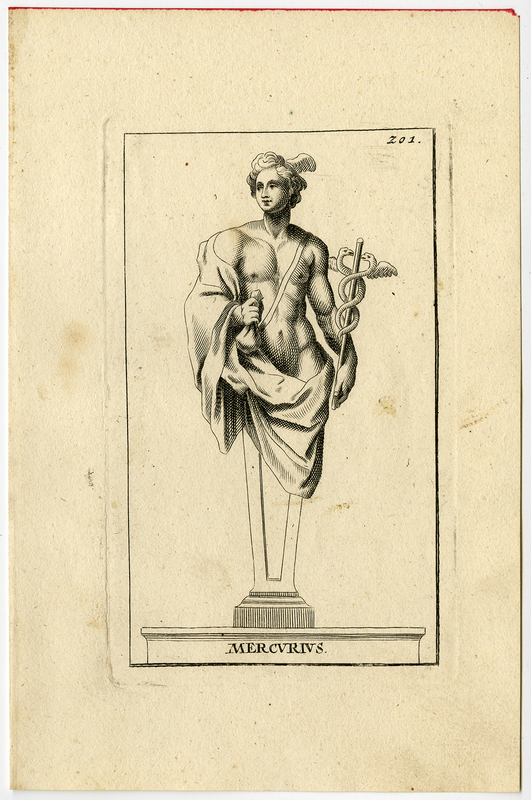 Subject: Antique print, titled: 'Mercurius.' - Mercury with medico. Plate 201, statue from Versailles Palace near Paris. Condition: Very good, given age. Light stains in the print and margins. General age-related toning and/or occasional minor defects from handling. Please study scan carefully. Medium: Engraving on hand laid paper. Size (in cm): The overall size is ca. 12.8 x 19.5 cm. The image size is ca. 7.8 x 13.4 cm. Size (in inch): The overall size is ca. 5 x 7.7 inch. The image size is ca. 3.1 x 5.3 inch. Description: This print originates from 'Furstellung der jenigen Statuen, Groupen, Bader, Brunnen, Vasen, wie auch anderer herrlichen Zierathen' by Simon Thomassin. This is the German edition (published in Augsburg: Joseph Friderich Leopold, 1720) of the book containing images of statues and ornaments from the Versailles gardens. The plates in this edition are copies in reverse of the original French edition ('Recueil des Figures', Amsterdam, 1695). Artists and Engravers: Made by 'Simon Thomassin' after an anonymous artist. Engraved by Simon Thomassin after marble statues.